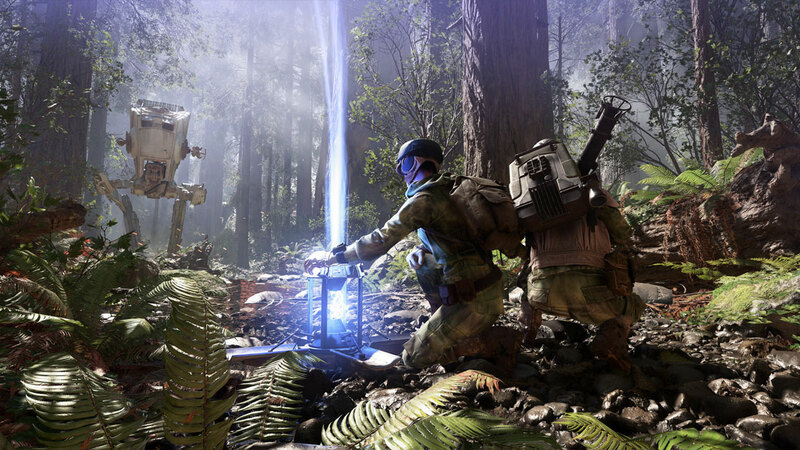 As promised, EA delivered the first full trailer for Star Wars: Battlefront this afternoon. The trailer is filled with two minutes of battle footage from the multiplayer shooter in development at DICE. The Frostbite 3 in-engine footage starts out on Endor. Stormtroopers and Rebel Alliance soldiers weave between the trees on speederbikes as ground troops fight below. An AT-ST, the Empire's two-legged armored vehicle, lumbers into view and the Rebel troops scramble. One of the Rebels deploys a portable shield to block the AT-ST's frontal lasers. This buys enough time for his jetpack-wearing comrade to take out the walker with his rocket launcher. An even bigger vehicle - the four-legged AT-AT, then appears. Fortunately, the Rebels' air support arrives. Y-Wings flying above the forest obliterate the AT-AT before it can tear up the rebel soldiers. The battle's not over just yet, though. Before the Rebels can celebrate, they notice Darth Vader decided to show up too. The camera cuts away before we get to see him make a mess of the Alliance forces. Star Wars: Battlefront's trailer closes with a montage of other battles: the Imperial assault on Hoth from Empire Strikes Back, X-Wings and TIE Fighters dog-fighting in the canyons of Tatooine (? ), and the Millenium Falcon leading an attack on an Imperial hangar on some volcanic world. We also get to see Boba Fett flying above the battle in Tatooine. Boba Fett and Darth Vader will both be playable characters in the game. Players will be able to play as legendary heroes from the Star Wars universe as well but they weren't shown off in today's trailer. I'm sure you can guess a few, though. 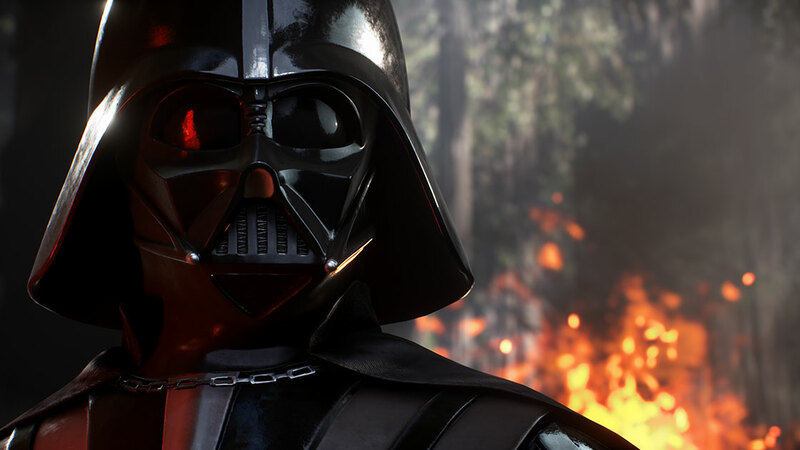 Battlefront is, as the earlier leak suggested, launching on November 17th on PS4, PC, and Xbox One. You can find out more at the game's website.